The global automotive market is an ever burgeoning pie and Audi is wagering $17 billion on taking a piece out of BMW’s share by expanding its product line, innovative technology and production capacity around the world. Most of the investment will go towards the development of more lightweight auto designs, electric powertrains and boosting production capacity in Hungary, China and a new plant in Mexico. The data was released in a statement today by the Volkswagen Auto Group, according to a post by Chris Reiter on Bloomberg. The German automaker has its eyes on becoming the largest in the world by 2018, and plans to overtake BMW in the same time period. 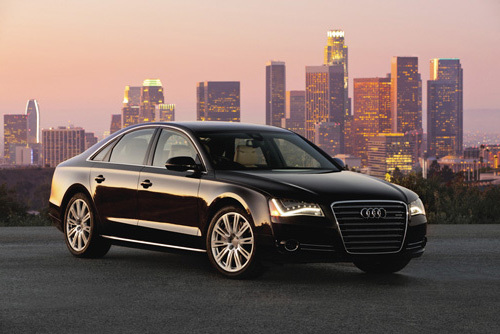 Audi will start by selling 2 million luxury units annually. Adding those to the total sales of the VW Group and its brands gives the manufacturer a good foundation to build upon. With GM and Toyota selling around 10 million vehicles this year, they have their work cut out for them, but plan to invest over $60 billion towards that end by 2015. European auto manufacturers have managed to offset the economic recession in Europe by boosting sales in the US and China. BMW sales are up 26 percent this year, followed by 11 percent at Audi and Mercedes-Benz at 5 percent. Remarkably, the gap in total vehicle numbers between the three is only about 25,000 vehicles. If it were a horserace, BMW would be in the lead only by a nose. Though Ford does not really compete in the luxury car market, they are making great progress in seeing that technology and amenities once found only in luxury cars is finding its way into more mainstream vehicles. So though there recently announced expansion of $773 million is dwarfed by the plans of the Volkswagen Auto Group, the only US automaker that eschewed the US bailout may soon become more competitive with luxury vehicles via the back door. Some people buy luxury vehicles to get features they can’t get in lesser cars. However, once those features are available in a car costing $10 to $20K less, Ford may gain market share as some people find something else to spend their money on, at least in theory. The automotive market is a might big pie, cut into a lot of little pieces. The competition for a bigger slice is not getting any easier, while the rewards of taking the lion’s share keep going up. The auto market in 10 short years may look a whole lot different especially if Audi has anything to say about it.